Brembo LCF 600+ exceeds all DOT 4 requirements and is suitable for use in all DOT3, DOT4, and DOT 5.1 brake system applications. LCF 600+ is an ideal choice for racing or performance use – combining ultra-high dry boiling point, low compressibility, and consistent pedal feel. 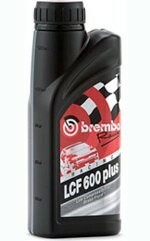 DO NOT USE Brembo LCF 600+ fluid in contact with any type of magnesium components (e.g. gearbox / clutch components) as a chemical reaction is caused resulting in gases being generated. This will then prevent the clutch hydraulics from working efficiently.